Frida Kahlo. That name, brimming with constant sorrow, incredible creativity, and violent feeling, was the focus of the Harn’s Mirror, Mirror … Portraits of Frida Kahlo exhibition. 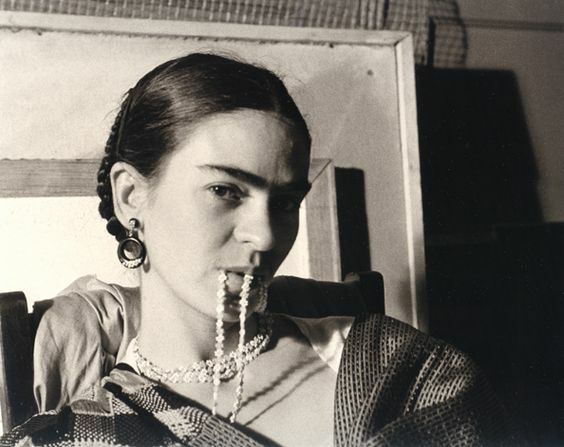 Frida Kahlo, a portrait shot by Antonio Kahlo in 1949, depicts the Mexican artist as a lofty, timeless woman in a cell of confined blacks, grays, and whites. Although her portraits vary greatly, this particular rendition of her serious lips and famous eyebrows lends insight into her inner struggles and persona. This photograph says that Frida is a monumental, intelligent, and dreamlike individual caught between the torrent of modernism and her traditional Mexican roots. To begin, this photograph implies that Frida is a learned, progressive woman. Most obviously, she is leaning against a case of books—some rigid, some floundering around the shelf—and seems to be part of the literature herself. The titles are blurry, but a few disjoint words (i.e. “art” and a depiction of theater masks) emerge. The dominant vertical lines of composition in the books, telephone, and the bookshelf also imply an upright, scholarly person that reads encyclopedias on the daily and can maintain an intellectual conversation about art history, plays, and philosophy. Her facial expression is also contemplative: set lips and a deepening stare that wanders far beyond the edge of the frame and into the space of the viewer. As for being “monumental,” the entirety of Frida—from her swathed dress to her elaborate jewelry—conveys the mien of an important, worldly person who has traveled to distant lands and absorbed everything culture had to offer. The use of perspective by the photographer was also jarring; the viewer looks up at Frida as she towers over our puny glances. The diagonal from our eyes to hers implies a sense of superiority and knowledge on her part, as well as the small nook of floor space she hasn’t taken up (she’s dominated everything else). She appears to be a larger than life figure. The way her clothing is positioned—the sinuous curves and lines contrast strongly from the rigid books—sets her apart from the drab background and ascribes a sense of statesmen-like importance to an otherwise domestic setting. We, the viewer, are so insignificant compared to her, she can’t even bear to meet our gaze directly. Michelangelo’s Pieta or the statue of Abraham Lincoln come to mind, especially in the dramatic folds of her dress, her volumetric body, and square/tightly packed composition. Next, despite Frida being portrayed as an intelligent, wistful being, a sense of anachronism also dogs her portrait. Modernism is tugging her into the future, but her Mexican roots—strong and unchanging—are dragging her back into a simpler history. This is most evident in the contrast of her clothing with the objects around her. Her traditional Mexican dress includes a long, patterned skirt, elaborate necklace and earrings, and a braided hairstyle of indigenous Mexicans. This patriotic attire seems out of place (or at least jarring) in the sterile, black and white setting of a domestic interior or office. The telephone in the left corner is the most obvious sign of modernism that directly contrasts with her native vibe. Hard, shiny, and compact, this artifact of new-age technology is nothing like the floral, soft, and feminine form of Frida. Despite her competence, Frida is an outdated relic of time travel, landing in a modern age that struggles to couple the past with a hurdling present. Her right hand, soft and outreached, stretches towards the viewer but ends in a closed fist that bars us from her prior history. This theory of a time-traveling Frida is also supported by the ruffled books on the third shelf. These books—messy and tattered—contrast directly to the tightly packed books further above her head. It seems as if she’s caused a hiccup in the fabric of time, disturbing the books with her outdated thinking and strong sense of the past. Finally, this photograph of Frida was shot in black and white. Although the other images were black and white as well, this color palette gives Frida an old, wise, and historical look as contrasted to the telephone and industrial bookcase. She could be an imposing figure—of wartime or politics—from one of the books surrounding her, alive and animated in an unfamiliar age. Finally, Frida’s struggle between modernity and history sculpts her into a dreamlike, ethereal figure who is far beyond the reach of normal humans. 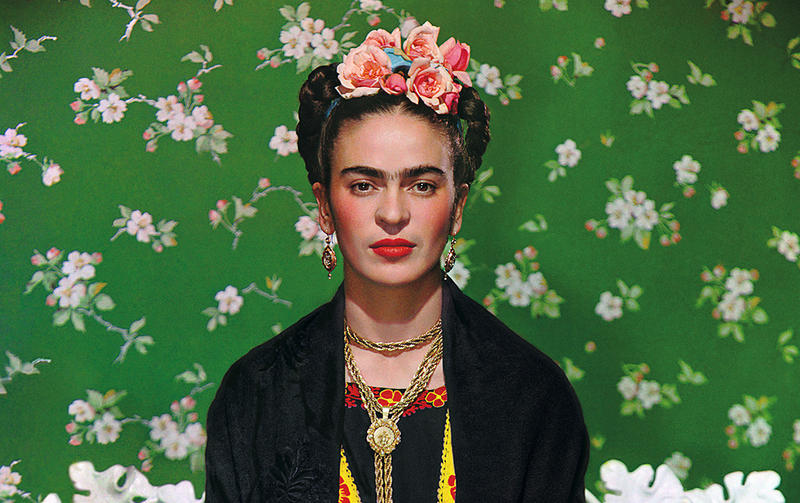 Whereas her background is vertical and unforgiving, Frida is soft, malleable, and fluid. Her garments resemble a bed ruffle (an extended metaphor being she’s the dream that emerges during sleep). The jarring lack of eye contact supports this theory of Frida being the dream of the past, a figure that sees beyond worldly objects and scuffles. She is scholarly (as proven above), but she is the tradition keeper of the past instead of the modern knowledge of technology, machinery, and science. The theater book by her legs indicates another layer of meaning—she’s an actress in this contemporary age, an imposter who isn’t supposed to be there. The lighting within the photograph is mostly even, although her flesh, especially her face and exposed arms, has a pearly, illuminated sheen to it similar to a polished statue or crystalized dream. On a final note, the viewer’s interaction with Frida within the image was interesting and a dynamic play between the past, present, and future. Frida was a colossal statue from the past while the hard objects around her (i.e. telephone) represented her immediate present. However, because of the dark/reflective nature of the image, I was able to see my reflection next to Frida and study her portrait from a future age. This interaction with her (it was like observing a timeless, beyond-reach figure) emphasized the dreamlike nature of the image but also the bizarre timeline hidden within it. This portrait of Frida characterized her as an intelligent anachronism from a distant, romantic past unreachable by either a modern, technological society or the future of today. Through her modern dress, unyielding background, and upward perspective, Frida morphs into a larger-than-life relic of tradition and history. © 2017 Learn Travel Art. Theme by XtremelySocial and Blacktie.